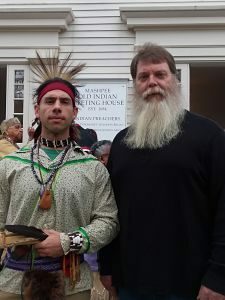 Sponsored by Harwich Conservation Trust and Barnstable Land Trust, please join 12th generation Cape descendant Todd Kelley and Marcus Hendricks of Wampanoag and Nipmuc heritage for a walk through the upland forest and high moraine or high spine of Barnstable. Along the way we will learn about the Cape’s glacial origins and how ground water itself shaped the landscape prior to sea level rise. As the oceans rose with melting ice water from the land, the longshore currents of gravity’s pull on seawater worked Cape Cod into the familiar shape and shoreline we know today. Take a walk with us through Iyanough’s woods and consider the lifeways and knowledge of the First People on this narrow land culminating with the arrival of the Pilgrims and other first immigrant settlers. It was here with Iyanough (also spelled Iyanno) the Sachem at Cummaquid (translated: “place on the other side of the water”) that William Bradford came in search of the troublesome Billington boy who went missing from the Plymouth settlement in 1621. We’ll weave a story of ancient culture and reverence of land as we hope to inspire you with a deeper understanding of the “sense of place” nature of community on Cape Cod.